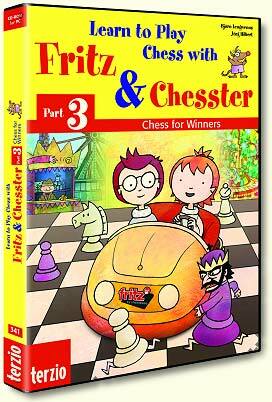 1/29/2007 – Fritz and Chesster is an award-winning children's program that can teach toddlers and grownups how to play chess. Part three has just been reviewed in USA Today which thinks it's a great way for kids' to expand their chess knowledge by teaching chess strategy within the framework of an interactive computer adventure. Excerpts. Lots of kids know how to move chess pieces, but when they learn tactics and strategies, they discover what makes chess such a great game. The computer game Fritz & Chesster's Chess for Winners is a great way for kids' to expand their chess knowledge. 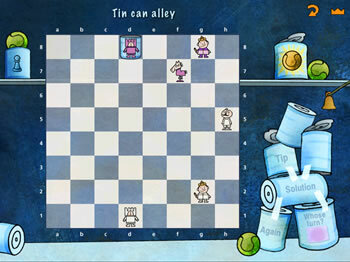 It continues the series' tradition of teaching chess strategy within the framework of an interactive computer adventure. Chess for Winners contains an excellent series of minigames that explore advanced chess theory. By presenting meaty concepts within a whimsical game format, kids can learn complicated tactics in a non-threatening way. Cleverly, the minigames break down the components of strategy into different levels within the game, and make good use of animations to help kids visualize what is happening. For example, when the program is trying to teach key squares, those squares will appear in a different color. Compared with Learn to Play Chess with Fritz & Chesster 1, this software has less of a storyline. Even so, it is well worth exploring if you have a child who is interested in chess. It is a must-buy for those children who have enjoyed the first two titles in the series. Fritz and Chesster is one of the best-selling chess programs in the world. It is aimed at young beginners (and their parents!) and involves inserting a CD into a drive and showing the very young child how to use a mouse – if that is at all necessary. Then step back and watch a new chess player emerge. 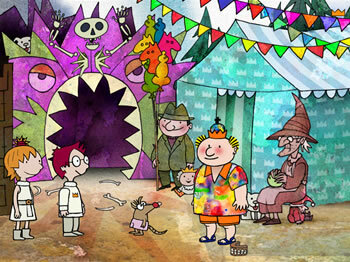 Within a week or two the child will challenge you to a game – and you better keep your wits about you! 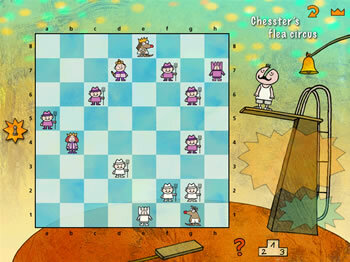 Fritz & Chesster is an unforgettable chess adventure, designed to advance young chess players' skills, move by move. It contains mini-games, brain-twisters and other attractive diversions. You pick up chess tips and skills as you ride in bumper cars and the Ferris wheel. Polish up your chess strategy and tactics, opening, middle game and endgame, and use what you’ve learned to win. System requirement. Mutlimedia PC: Pentium II 233 processor, 32 MB RAM (16MB free memory), 16-bit soundblaster compatible sound card, 16x speed CD-Rom drive, Graphics card: resolution 800x600 pixels (16-bit colour), Win ME/XP. 30.01.2006 The prestigious Computer Times has selected Learn to Play Chess with Fritz & Chesster and Learn to Play Chess with Fritz & Chesster 2 as an Editor's Choice Software in the January 2006 issue of the magazine. The program is also number 47 amongst all software sold by Amazon.com. Check it out! 1/6/2005 Our children's chess teaching program is out there, generating thousands of new chess players. Like no other chess software "Fritz & Chesster" has scaled the mail-order lists, landing on the top of the Amazon top-sellers. Now version two is out and getting rave reviews. 12/15/2004 The original Fritz & Chesster children's teaching program is currently number two on Amazon's overall top selling software list, just behind Adobe's latest Photoshop Elements 3.0. Quite unprecedented for a chess program. First reviews of volume two lead us to suspect that it will do as well as the original. 11/13/2004 For the first time the bestseller list in the Children software section of Amazon was topped by a chess program – ahead of Nancy Drew, I Spy and Backyard Baseball. Learn to Play Chess with Fritz & Chesster by Viva Media has received a 4½ (out of five) star rating. Meanwhile Viva has announced the release of Fritz 8 Deluxe. Curious? 3/25/2004 Our children's CD-ROM title has won the 2004 Parents' Choice Gold Award. 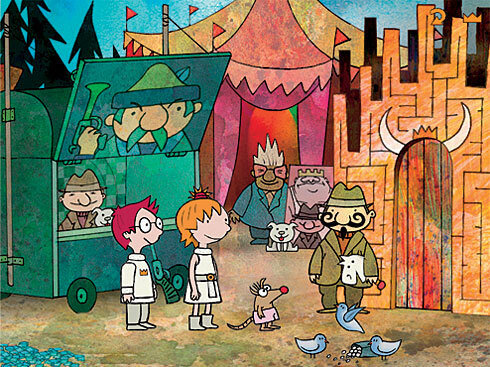 The reviewers found Learn to Play Chess with Fritz & Chesster "wonderfully unexpected, charming, simply animated, and cleverly designed." It is number 35 on Amazon's top selling software list and has received almost exclusively five-star reviews.